The NEWFDA Convention is the food industry’s best kept secret! Every year mid-fall we host a spectacular event at a Florida resort bringing together industry executives from the wholesaler, manufacturer and broker community. This four-day, three-night excursion promises a relaxing, fun-filled atmosphere while building and strengthening industry relationships. We offer some of the most unique experiences including water sports & activities, tours & workshops, and our renowned SPARTY – a combination of luxury spa treatments held in a party environment. Our Hospitality Suite, another highlight of our Convention, is an exclusive venue allowing manufacturers to display new and exciting products, allowing attendees to select unlimited items to enjoy at the Convention and at home. The NEWFDA business sessions always draw current industry experts and prominent guest speakers that inform, entertain and educate our members. We guarantee you’ll leave feeling relaxed and revitalized having spent valuable time with colleagues old and new. Download the 2019 Convention Registration Form here! 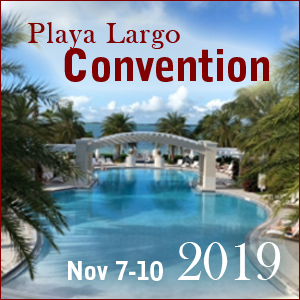 Join us November 7 -10, 2019 (Thursday-Sunday) for the Annual NEWFDA Convention at the incredible Playa Largo Resort & Spa in Key Largo, Florida. It will be NEWFDA’s first visit to this incredible facility which promises the ultimate experience! In addition to the truly therapeutic views and calming effect of Florida Bay, Playa Largo offers a host of activities and experiences designed to renew your mind, body and soul. The spa, fitness and recreational offerings complement a variety of fresh, local and gourmet restaurants and round-the-clock service seasoned with both the pleasantly simple and the technologically advanced. Begin your odyssey in the Florida archipelago at Playa Largo. Hope to see you there! Stay tuned for convention registration, contact Kevin Griffin with any questions.